I got my free Google Wave invitation from LiewCf, thanks for the invitation! Ok, now is my turn to give you guys, my blog readers, the free invitations. To me, Google Wave is like a chatting program (e.g. MSN) where a few people can have collaboration in a channel (the Wave). Everything can be happened in real time (e.g. the message you type) and everyone in the Wave can see the chances in real time (almost). And it is also like a social website (e.g. Facebook) too where you can put in applications (Gadgets) and use it within a group of people. 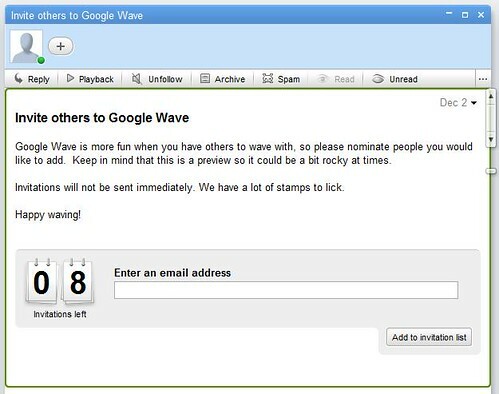 How to Get a Free Google Wave Invitation? It’s very simple. All you need to do is to leave a comment in this post (with your email address) and state that you want to have a free Google Wave Invitation. You will not need to do anything else in order to get the invitation but it would be appreciated, if you could subscribe to my blog feed. Thanks. Be hurry, I only have 8 invitations in total. First come first served. Note: It may take some time to get the invitation arrive to you inbox (as according to Google Wave). I have sent a invitation to you. Enjoy! please invite me if you have any left. Hello, if you still have invitation, i’ll be pleased to get one. Thanks in advance and happy christmas ! Hello, I am looking for a google wave invitation. Thank you so much! If you still have an invite, I’d really appreciate it if you would send me one. I sent you the invitation.